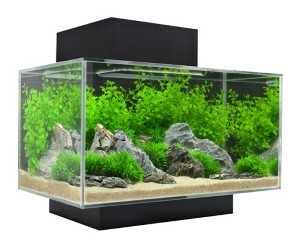 EDGE's simple, uncluttered design allows a clear and unobstructed view inside the aquarium, thanks to a housing module that conceals all essential equipment. Even the wiring is cleverly hidden. Perfect for homes or offices, its compact design fits perfectly in areas where space is limited. It will add a splash of life to dull areas such as countertops, desks or pedestals. EDGE includes a powerful and efficient LED lighting system that creates ideal lighting for fish and aquatic plants. The shining aquarium wil bring a ray of light to dim areas begging for visual excitement. A sealed glass top allows excellent aerial viewing. An overhead ventilation grill dissipates the heat from lighting, preventing moisture and reducing maintenance. A removable cover allows direct access to the aquarium and filter. 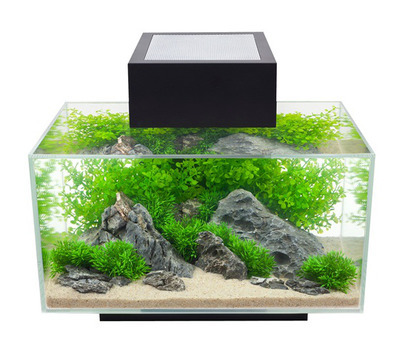 EDGE comes with a powerful 3-stage aquarium filter that keeps the water clear and healthy for fish and plants.